I made the Purple Panda with acyrlic punch embroidery thread, see free pattern here. 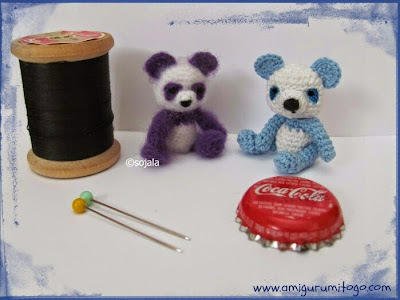 I was curious how the pattern would work if I used crochet thread #10 so I followed my own pattern with minor modifications I made the tiny Blue Panda Bear pictured on the right above. I don't like working with cotton crochet thread much, I find working with acrylic thread much easier to shape and also much easier on the fingers. The results of the cotton thread are still cute though! I used a 1.00 mm steel hook with crochet thread #10. I had to eliminate row 11 of the body pattern and just finished off once I completed row 10 to make the head fit on right. And I also eliminated the eye patches and just used a permanent felt pen to draw in the patches, then a black pen to put in the eyes. I would have designed this pattern slightly different if I had made the panda with cotton thread first but it still is a workable pattern as is. Please post pictures on Amigurumi Freely if you make a Panda!